North Korea test-launched several short-range unidentified projectiles toward the Sea of Japan from Gwangwon Province, South Korea’s Joint Chiefs of Staff (JCS) said on Saturday morning. “North Korea fired several unidentified short-range projectiles toward the East Sea… near the Gitdaeryong in Gangwon Province at around 0649 KST today (August 26),” the JCS said in a statement. The JCS said the projectiles traveled around 250 km, and were launched from the coast of Kimchaek port city in North Hamgyong Province. 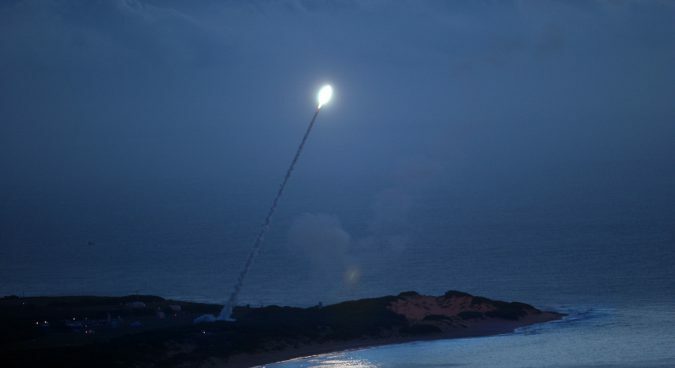 U.S. Pacific Command (PACOM) initially said on Saturday that the North had launched three short-range ballistic missiles near Kittaeryong, but that two had failed. PACOM later revised the statement, saying that missiles had flown “approximately 250 kilometers in a northeastern direction” and that only one had failed in flight. If the test is confirmed to have been of a ballistic missile, it represents the North’s thirteenth of 2017 and the 8th since the inauguration of Moon Jae-in on May 10. Most recently, the North test-fired the Hwasong-14 intercontinental ballistic missile (ICBM) twice, on July 4 and 28. Seoul’s Blue House, however, told media that the North Koreans “are presumed to launched” artillery rockets from “improved 300-mm Multiple Rocket Launcher” (also known as KN-09). The statement was issued after a meeting of the standing committee of the National Security Council (NCS) was held for around one hour starting from 0830 KST. Chief of the National Security Office Chung Eui-yong convened the NSC meeting. The KN-09 is a Multiple Launch Rocket System (MLRS) that, South Korean military officials estimate, can fire up to 12 rockets at once per launcher. It is estimated to have three times the destructive power of the 122mm rockets the North fired at the island of Yeonpyeong-do in November 2010. “Even though [the weapon] is called as multiple rocket launcher, it has self-propulsion and also guidance capabilities,” Kim told NK News. South Korea’s Ministry of Unification (MOU) said on Thursday that Seoul was hoping that North Korea’s recent restraint from “further provocations” would lead to better conditions for inter-Korean dialogue. The unification ministry’s statement echoed those made by U.S. President Donald Trump and Secretary of State Rex Tillerson on Tuesday, in which they welcomed North Korea’s recent “restraint” – an opinion also shared by a Chinese foreign ministry spokesperson the following day. Tillerson said on Tuesday he wanted to “acknowledge” that Pyongyang had not conducted missile tests since the adoption of the most recent UNSC resolution and commended Pyongyang for its restraint. The test comes amid the two-week long Ulchi Freedom Guardian (UFG) joint military exercise by the U.S. and South Korea, which North Korea’s army on Tuesday described as “military confrontation” against the DPRK. Around 50,000 South Korean soldiers and 17,500 total U.S. service members, with approximately 3,000 coming from abroad, are due to participate in the combined military exercises, which take place every year in August.